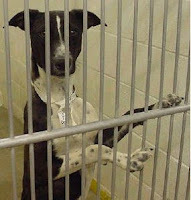 5 minutes will save a shelter dog's life! Please sign up for www.IGIVE.com in support of Ariel Rescue. There is no cost to you and it is a safe, inexpensive way to help homeless animals. Ariel Rescue desperately needs donations. Ariel Rescue is a 501 (c)(3) IRS-approved public charity that has been saving the lives of shelter dogs in impoverished areas for 10 years. We have rescued and placed over 1000 dogs that would have otherwise been euthanized. Right now, the situation in the shelters is the worst we have ever seen. Dogs and cats are being dropped off by families at such an alarming rate that many are being turned away. We are a small group of volunteers and doing all we can to help the animals in need. One small way, anyone can help raise money for our cause is to go to http://www.igive.com/ Igive is a website where you can go and register in 5 minutes as a supporter of Ariel Rescue. Then, if you use their browser or shop in any of the thousands of online stores, we receive an automatic donation. Participating stores range from Amazon.com, Drugstore.com, travel websites such as Priceline, pet shops such as SitStay--they are all there! All you do is go to http://www.igive.com/, click on that you want to support Ariel Rescue and then every time you shop, be sure to click first on the igive window. It takes less than 5 minutes, doesn't breach your security and will amount to a lot. One Ariel Rescue volunteer has already generated $100 so far this year which is enough to pay for one dog's life being pulled out of the shelter. You can make a difference right away by signing up. Please help us pay for veterinary care and boarding for these poor helpless animals. Also, donations are also always appreciated and are tax-deductible. Donations can be mailed to Ariel Rescue, P.O. Box 723 Dana Point, CA 92629 You will receive a tax-deductible receipt.